I, and several other bloggers who suffer from multiple chemical sensitivity, talk about how hard difficult it is to navigate public places and deal with the multitude of fragrances both in the buildings themselves and on those in the buildings. Have you ever walked by and thought the person you just passed must have bathed in perfume? Since becoming ill I have thought that these people have masked to chemicals or have simply lost the ability to smell. Therefore, they keep putting on their fragrances until they can detect the fragrance. I remember returning to my last workplace after becoming ill and being absent for many months. I had gone to gather my things because it was obvious that I would not be able to return to work. I walked in with my mask to gather up my belongings. Suddenly I realized that their were fragrances. The fragrances were everywhere I turned. They were overpowering even with my mask on. I quickly walked out. My fellow co-workers wanted to visit with me. I had to stand outside and keep them at a distance. I asked them if they had always worn perfume? They all replied that they had. Why hadn’t I noticed before? Why didn’t I notice the odor of the paint that was being applied to the door facings while I sat at my “new” desk with “new” carpeting still being laid down around me? My only answer is that my sinuses, because of so many infections and surgeries, just could no longer detect anything. I was sick everywhere I went but had no idea all these chemicals were adding to my body’s already weakened system and over all body burden. It wasn’t until recently when I had a bad night and could not sleep that I turned on the television and heard a commercial. AHA! There was the answer. I had been “nose blind” due to all that my sinuses had gone through. This also explains why so many others not only where perfume or cologne, but bathe in it. They are “nose blind” until they get to a certain level of fragrances. The commercial was for “Febreze”. The person was talking about their pets and the odors they caused. The person said she had become “nose blind” to all the pet odors. When friends came to visit it was like visiting a place with twice as many animals. The answer, of course, was to just spray the house with “Febreze”! The chemical industry is bombarding us with more and more chemicals on a daily basis. I forget the number of new chemicals that are introduced each year; the number is staggering. Dr. Rea said once that we were just the tip of the iceburg so to speak when he talked about chemical sensitivities. We need to stay vigilant and continue to speak out about the dangers of chemicals and the debilitating effect they have on us. I have had many new followers in the past week thanks to the I Am A Writer’s $300 Holiday Cash Giveaway that I am participating in. Following my blog is my entrance requirement to the giveaway. I would like to say “thank you” to all my new followers. I hope you will continue to follow along and learn more of my journey with mold-induced illness and multiple chemical sensitivities through my blog posts and my book. Thank you also, to my loyal followers and especially to those who take the time to not only read my posts but comment and re-blog them. The Month of May has been dedicated as Multiple Chemical Sensitivity (MCS) month. I suffer from MCS (also known as Environmental Illness and Chemical Sensitivity). I did not always have MCS. I was a very active and busy stay-at-home mother of two. I was active in their school, their activities, as well as in our community. I lived by my at-a-glance calendar to know when and where I was supposed to be at any given time on any given day. I sewed and did craft fairs. I baked and canned, and did things with my friends. My MCS began after a mold exposure in my work place where it first manifested itself in severe sinus issues and brain issues (although I didn’t realize the brain issues were happening in the beginning). My boss would bring a phone message that I had written and placed on his desk to have me explain it to him. I remember many times writing a message and then realizing it was sloppy or didn’t make sense and redo it. The sad thing is that even then the messages would not make sense. Yet I still had no idea my brain wasn’t functioning correctly. I didn’t know what was wrong with me or why I was constantly getting sick. It took nearly a year to discover that there was mold in the office and and a few more months before my ENT could get mucous taken from my sinuses to grow in a culture plate. I rapidly began reacting to all sorts of medication and developing food allergies. The chemical sensitivity took a little longer to rear its UGLY head. When it did, I was shocked. I had seen others where the masks and walk around in a daze but that wasn’t me! At least that is what I kept telling myself until it was me and there was no escaping it or denying it. Mold isn’t the only thing that can push someone into “MCS or environmental illness land”. An extreme exposure to pesticides will do it. An extreme exposure to chemicals in the workplace can do it. Slow but steady exposures to chemicals can also eventually cause someone to become sensitized to chemicals. How much is too much? There is no answer to that. Everyone reacts to different levels of a chemical. Not everyone has the same toxic load already before being exposed. Do people think we are crazy? Do they think it is all in our head? There are some that do. Sadly there are family members who condemn their own brother or sister or mother for having a sensitivity to chemicals. They truly do not want to accept that this condition actually exists. For if this exists, they may have to change their habits to avoid causing further illness to their family member. I have seen husbands leave their wives over this illness. The isolation that MCS causes is dark and lonely. Very lonely. For that reason I chose many years ago that I would begin writing my story. I would become an advocate to the best of my ability. 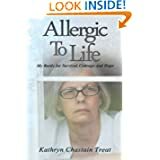 I started by writing my story which is now available (Allergic to Life: My Battle for Survival, Courage, and Hope). A link to purchase is in the sidebar. Throughout the month I will be reblogging posts from some of my fellow bloggers who are also posting about MCS Awareness month. Last month I celebrated my 2 year Blogiversary. As a celebration, I began a giveaway on Rafflectopter. I several items included in the giveaway. Take a moment to click on the link and enter the giveaway which runs through the end of May. Happy Blogiversery – Where has the time gone? It’s My Blogiversery! Let’s Celebrate! Where has the time gone? I wrote my first blog post on April 25, 2012. Here we are two years later and so much as happened. I finally published my book, “Allergic to Life: My Battle for Survival, Courage, and Hope” (How amazing is that? ), had a book launch party, and did a meet the author at a health food store. My list of followers continues to grow and I have met so many amazing authors, bloggers, and others who suffer from environmental or other chronic illness. I have joined a writing group, PnP Authors, and became Membership Director for Rave Reviews Book Club. started a second blog, Be My Guest, for authors (There will be a special gift for those that sign up to follow my new blog. The names of new followers will go into a hat and my husband will draw a winner). I have also had a wonderful book blog tour where I was hosted on 12 blogs over a period of a month. In honor of my Blogiversery, I am having a giveaway. The winners will be determined through a Rafflecopter Giveaway. The giveaway starts now and will run through the 25th of May. There will be chances to enter more than once. To find out what and how many gifts (yes there is more than one since “it is my second blogiversary”) are available. I know my blogiversery doesn’t officially happen until next week but why wait to start the fun! WOW! It wasn’t enough to learn that e-cigarettes can contain propylene glycol (see my post Dirty Secrets of E-Cigarettes). In our local newspaper there was an article on Thursday, April 10th, (the day I was enjoying my anniversary) entitled “Liquid nicotine poisoning on rise”. According to the article the number of calls to poison control regarding exposure to liquid nicotine has risen from one call per month in September 2010 to 215 calls per month by February 2014. If that isn’t scary enough, more than half of the calls involved children under the age of 5. So, what is drawing children that young to these e-cigarettes? Most e-juices come in fruity flavors like cotton candy, cherry cheesecake, and fruit punch? Can you just imagine that? I cannot! According to the CDC, poisoning related to these e-cigarettes occurs through direct skin or eye exposure, ingestion or inhalation of the e-liquid. Of course they do not mention the propylene glycol that is also an issue. One smoke shop owner said that he was aware that the e-liquid packaging is not childproof but felt it was the parent’s responsibility to keep the poisonous product away from their children. He also stated that the number of e-juice manufacturers is out of control and it is totally unregulated. Another smoke shop owner said that cigarette sales seem to have gone down while e-cigarette sales are going up. I had a discussion with my daughter about this article. She teaches freshman at a local high school. She told me that some of her students have asked about them and what she thinks. She tells them that there are no long-term studies and that those using them are guinea pigs. To view the entire article, click here. Click here for an article on Hookah Pens. What are your thoughts on e-cigarettes? Yay or Nay? Environmental Illness is costly not only emotionally to the person suffering through it and their family but it is monetarily costly as well. In the beginning of my illness I was sent to an allergy and immunology specialist by my ENT, Dr. Spitzer. Our insurance paid for the office visit but did not cover the EPD (enzyme potentiated) treatments. These treatments consisted of two injections given every two months at a cost of $150.00. My insurance did not cover the special B Vitamins I needed. And it didn’t cover the special flours and other items I needed to bake my own breads, cookies, and crackers. I had been told to avoid wheat, oats, barley, corn, and fermented products like soy sauce, catsup, vinegar, etc. I began making trips to a health food store an hour from home to buy rice flour, tapioca flour, potato starch, garbanzo bean flour, carob products, guar gum (a stabilizer to replace gluten not found in these flours), and special rings to make my hamburger buns. Fast forward a bit and I need to take a nebulized antifungal. My insurance would pay for the nebulizer ($150) but not the compounded antifungal for the nebulizer ($1200.). Fortunately, I was put into a a trial that allowed me to buy the antifungal for $300.00 I believe. Before long I was being sent to Dallas for the first of what would be several trips. I had filed for workers’ compensation but who knew what the outcome would be and if these new expenses would be covered. My first trip included the cost of airfare for both my husband and I from California to Dallas. It cost us over $400 to rent a car at the airport for the week my husband would be there (we learned that it would have been cheaper to rent a car outside of the airport). There was the expense of my husband making a second round trip by air to visit me when my stay was to be extended longer than we had planned. The cost of my room was $1100 per month for a two-bedroom environmentally safe apartment if I shared it with a roommate. My stay was nearly four months. None of these expenses were covered by insurance. I had to buy organic food and unusual foods for testing when I was rapidly losing foods that I normally ate. A loaf of yeast-free bread made of water chestnut flour was $7.00. A water chestnut flour bagel was $3.00. My bottled water was over $1.00 per bottle. I had to have special shampoos and soaps as well. Again these were not covered by insurance. My treatments had to be paid up front and then submitted for reimbursement by my insurance. Each item I did skin testing on cost me $23. I can’t even begin to tell you how many items I tested just to find safe foods and that was before I tested molds, pollens, and other inhalants. I was doing two IV therapies a week at $125 per IV. I was doing daily sauna therapy that was $35 per session. I was doing oxygen therapy. I was going through numerous labs and tests that were also very expensive. Weekly I would pull out a credit card one that still had room to charge on it), pay the weekly bill, then spend the weekend putting it all together to mail to my insurance. They paid a percentage of those bills. I returned home from Dallas with antigens that I needed to take daily (I rotated them using a four-day rotation) and these items were expensive as well. After having a urine Tricothecene test, I learned that I was continually being made more ill by the mycotoxins on my clothing that had been contaminated from work. I had to give away my clothes and start over because the cross contamination of mold and mycotoxins would continue to make me ill. My mother came over and bagged up all my things. You can see pictures of this in my blog post, Environmental Illness – Not for the Faint of Heart. I also purchased a sauna for $3,500.00 that was not covered by insurance but was needed to continue my detox regimen at home. I bought only a few clothing items because I could not afford to replace my entire wardrobe. Dr. Rea from the Environmental Health Center – Dallas issued a letter that included a rough estimate of costs that I would incur as a result of my mold exposure to be used in court. I will include more from that list and other expenses during Part 2. If you are cooking your food in nonstick Teflon pans, you are ingesting all the chemicals that make up Teflon. You are also breathing in the fumes as the pans heat up. There have been many reports on the negative effects of using nonstick pots and pans as well as cooking with aluminum. I grew up as a child eating everything cooked in aluminum pots and pans or fried in cast iron skillets. Then about the time I got married nonstick cookware was all the rage. I had nonstick everything, never really thinking about what I was ingesting after having my food cooked in these pots and pans or what I was breathing into my lungs as these pots and pans heated up. 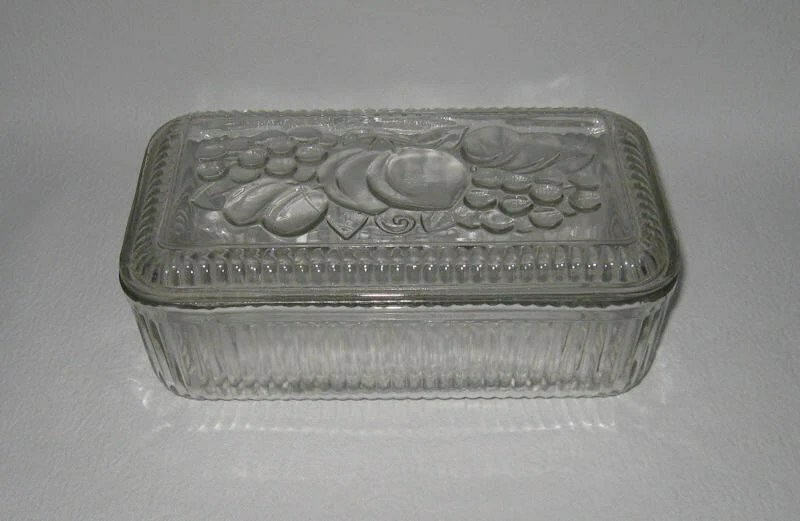 Going to antique stores and seeing the lovely glass refrigerator dishes made me want them because they were pretty and represented a time we all refer to as the June Cleaver days. Of course, I didn’t buy them. What would I do with them? Afterall, I had my Tupperware and Rubbermaid to store my food in the refrigerator, freezer and cabinets. Becoming ill with environmental illness suddenly opened my eyes. I have become more aware of the food I eat, the chemicals used in the home and the utensils I use to prepare my meals. I store my food in glass in the refrigerator and have glass jars for items I store in the cabinets. 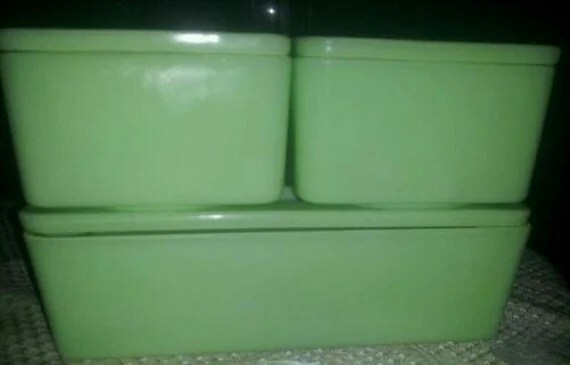 I still long for the beautiful old refrigerator ware shown below. I can’t go into antique stores because of my mold allergies but may check into some reproduction pieces of this beautiful glass ware. 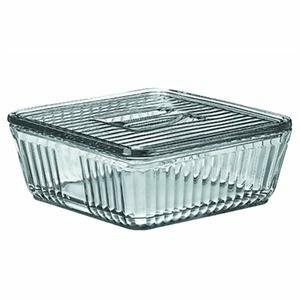 The last picture below is what new glass refrigerator dishes look like. I found it on Amazon. While it is not as pretty as the antique ones, I think I may invest in a couple of pieces very soon. Today I cook my food in stainless steel pans, cast iron skillets and enameled cast iron pans and pots. My dear friend Sonda at sondasmcschatter reblogged about choosing healthy safe cookware a few days ago. When I first talked about safe cooking utensils I had meant to come back and talk about seasoning those old cast iron skillets. I found two links for seasoning that are fairly simple and straight forward. They can be found here and here. So, tell me what is your food cooking in? I would love to hear what others are using and what you think about nonstick pans (even the new ones that say they are safe). I am always looking for safe alternatives for just about anything. I love that Sonda from sondasmcschatter is always sharing some great ideas and tips with us. 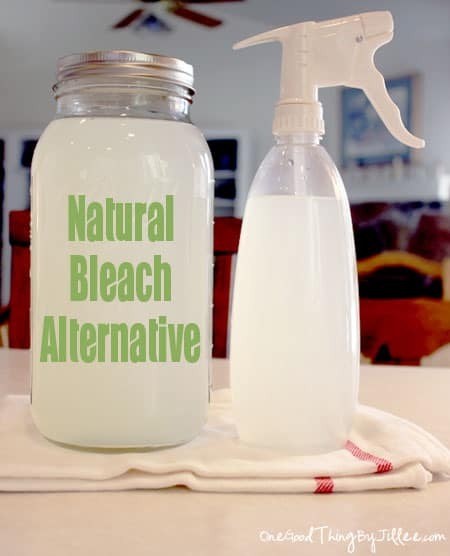 This tip involves water, hydrogen peroxide, and lemon juice. I am curious have any of you tried this? I think it is something I might want to give a try. The tip she mentions comes from OneGoodThingByJillee.com I took a moment to subscribe to this blog to see what else I could find. Amanda from Celiac and Allergy Adventures featured a blog post with this title. 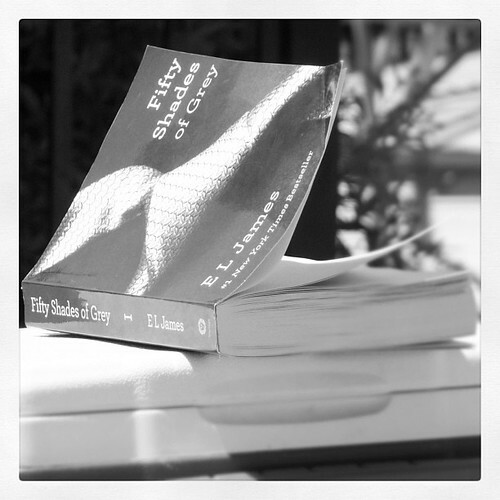 I loved how she compared allergies and Celiac Disease with the book, 50 Shades of Grey. For me adding in mold and chemical sensitivities and Amanda has it right on. I thought I had posted this in 2012 but in searching my past blog posts I only found a few comments and Amanda’s text wasn’t shown. So for all of you, please visit Amanda’s blog and read this post. A few days ago I posted about a young woman who has been forced to quit school because of an allergy to books due to dust, mold, and chemicals. I wrote that could empathize with this young woman because of my allergies to mold and dust and my extreme sensitivity to chemicals. A dear friend and fellow blogger, Michellina, from the-labyrinth is a student at Victoria University in Australia. Despite having similar allergies and sensitivities as I, she has managed to get the most amazing accommodations at her university allowing her to continue her education. I am in awe of all that she has managed to accomplish for not only herself but her fellow students who may or may not know how to go about getting accommodations or who may be afraid for fear of being labeled “crazy”. Please read Michellina’s post and learn all that she has managed to get done while a student at Victoria University.